If you need a shipping container in Tacoma, look no further than Haulaway Storage. We rent out a range of storage solutions for a variety of different uses. The applications are endless, and they include things such as construction sites, government uses, industrial applications, hospitals, schools, retails, offices, and also residential. If you are looking for a conex container for sale, contact us and find out about our affordable and convenient services today. Conex containers are large intermodal storage boxes that are made for freight transport, which makes them easy to transport and convenient for many different uses. Our customers of shipping containers in Tacoma typically rent a certain amount of storage containers for a given period of time. We deliver the container or containers to them, and pick the containers up when the customer is done with them. At their business or residence, the roll off container may be filled with whatever the customer needs to use it for. The containers function as extra, temporary storage. The benefits of this are twofold. First of all, the items being stored are not far away from the primary location of the business or residence. And second, the customer does not have to pay high prices to build storage that they may not need permanently. 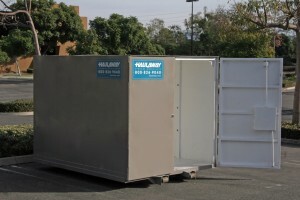 Our containers are highly secure, so you can rest easy when you choose Haulaway. We know the value of convenience and affordability, and we want to work with you to figure out which containers would be best for your purposes. Contact us today to start the process!